Summer sewing is always better when it's fast, and nothing sews up faster than knits. Simple shapes, minimal seams, and no need to finish edges means you can cut out a new dress or top in the morning and wear it that afternoon! We have some fun new knit prints coming in right now. Take a look! There's so many more knits to choose from in our store, from prints and patterns to solids, stripes, and polka dots! Here's an ultra sheer, lightweight top perfect for the summer heat. Made in fine cotton voile with a fun polka dot print, it's perfect for layering over a basic tank or even a strappy dress. Mary used McCall's 7093 to make this top. Look familiar? She also used it to make another top, seen here. It's amazing how different the two projects look! With a sheer fabric, the diagonal seam details really pop. You know you want a quick new summer blouse! Come and see what we've got in store. Cotton + Steel Holiday Prints! Summer is still going strong, but some great holiday prints are coming into Treadle. Now you have lots of time to plan all those holiday projects! First up we have a group of Halloween prints from the Spellbound line by Cotton + Steel. Check out the ghostly dresses floating through the trees. Next up, Cotton + Steel has released their Tinsel line, featuring trees, snow globes, letters to Santa, confetti paper, and more! Get a head start on your fall and winter holiday decor and crafts! Summer is all about feeling comfortable, and we all want our clothes to be as relaxed as we are. This cool, comfortable gingham dress made by Rebecca is a perfect example. Oh, and it's pretty cute too - bonus! Rebecca was kind enough to model her charming dress. She used Burda 6758, a sleeveless dress with some interesting seam detailing. And it goes great with a cardigan! We have an adorable new project panel from Alexander Henry: Chicken in the Kitchen! This cut-and-sew pattern includes all the pieces you need plus step by step directions to make your own sweet little chicken! Just add fiberfill. The pattern suggests putting a rock in the base to use as a doorstop. 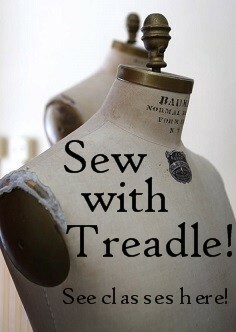 You could also modify the directions to make a tea cozy, or simply use as a decoration or soft toy. Don't you think you need one? I do. Here's something sure to brighten your day! Check out this simple shift dress made amazing by the choice of fabric. It's a waffle-textured cotton blend, printed with colorful tropical birds and flowers. This large scale print is just amazing, with a high impact look that means even simple garments get a big punch of wow! Mary used Butterick 5706, a basic pattern with simple lines and not too many seams to disrupt the print. This linen blend has a soft, thick, and lofty hand. Perfect for a transitional-season jacket! Next we have these truly amazing linens printed with a digital process. The colors are so vivid and the designs so irresistibly gorgeous! Come find your perfect summer linen! If you're a Treadle regular, you know we always have lots of wonderful goodies in our Japanese import section. The Japanese fabrics we stock range from ironic, retro-inspired prints to breathtakingly beautiful abstracts and florals. Here's a peek at some of the newest additions. I adore these tiny robots! This muted confetti dot print is on dreamy soft cotton double gauze. This abstract design is a large-scale border print. Finally here's a bright printed linen from the Echino line. The blending of realistic animals and abstract geometrics is one of their signature styles. Looking for something comfy to grab and pull on this summer, but still want to look put together? This knit skirt is soft and comfy, but full of great details. Made from Butterick 6180, a Katherine Tilton pattern, it uses colorblocking to add visual interest, and the shape narrows slightly at the hem for an unexpected and flattering twist on the same old silhouette. The wide, fold-over waistband is soft to wear and versatile, too - wear it up for a high-waisted look, folded smoothly down, or in scrunchy folds for more texture. Our Summer Sale ends today! It's your last chance to take advantage of the savings, so hurry in! We'll be closed this Saturday, July 4th in observance of Independence Day.